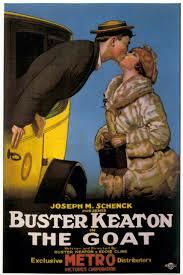 Special Purpose Movie Blog | There are people who never much cared for Keaton. Those who do cannot care mildly – James Agee. The year is 1890, one Benjamin Harrison is in the Oval Office, steak is a scandalous 17 cents a pound and the federal government is running a surplus of only $85 million. So begins Buster Keaton’s distinctly odd entry into the Twilight Zone canon. A mix of loving pastiche, creaky sci-fi and homily to the joys of hearth and home. ‘Once Upon A Time’s’ opening, and most successful, segment introduces us to Woodrow Mulligan (Buster), a slightly grumbly old cove irritated by the sound and fury of his small town in the late Victorian era. This whole section is presented as a silent – scratches on the film, jingly piano soundtrack and all – and it’s rather charming. Buster gets to fall into a water trough (there’s nary a one of his classic era movies in which he doesn’t get a soaking one way or another) and there’s a nice little running gag of inter-titles being ‘censored’ when somebody says a bad swear. It’s the sort of joyful spoof that only works if the makers have genuine affection for their subject. Via the convenient discovery of a ‘time helmet’ (which does look brilliantly of its time – it brought to mind the episode of [insert name of no doubt extremely well known American show] Marty McFly sees when he arrives in 1955 – Woodrow finds himself deposited in 1961. Not quite the haven of peace and quiet he was looking for. At this point, we flip into sound and have some fish out of water fun as Woodrow struggles in the modern world. Modern at the time of production, of course. Looking at it today, 1961 is nearly as long ago as 1890 was then, so it feels more like a second safe, quaint world than something brash and new. There is some good stuff in this section, a nicely done little ‘that guy on TV is talking to me’ gag which is all about timing – something Buster clearly had not lost and, perhaps best of all, a re-creation of a gag Buster first shared with Roscoe Arbuckle in The Garage (1920). In The Garage, Buster is hiding behind Roscoe as they go past a suspicious cop, as they move past Buster slips in front so the cop is only seeing Roscoe’s back. It’s simple, but beautifully done. In this version, the big man to Buster’s little guy is Stanley Adams as ‘Rollo’, a scientist (of some description) who immediately believes Woodrow is from 1890 (well, he can name the President, after all) and quite fancies using the helmet to get back to a simpler time. The ‘borrowed’ gag still works pretty well but, I think pleasingly, not quite as well as it did with Roscoe. It’s somehow reassuring that two great clowns at the peak of their powers can make a simple bit of pantomime look more fluid and more effortless than even a well done reproduction. Woodrow and Rollo [SPOILER ALERT] do make it back to 1890, but the twist is that Rollo misses the creature comforts of 1961 (TV dinners and bikinis apparently a particular loss), so the Time Helmet gets another outing and sends him home. Now, I claim not particular Twilight Zone expertise (slightly before my time, and it was never the touchstone over here that it was in the States – I guess we had Doctor Who instead?) but I’ve seen enough of them (or at least, Treehouse of Horror skits on them) to get the sense that they normally came with more of a sting in the tail. Running with a separate story every week does give you the freedom to do that (check out Inside No. 9 for recent examples – and just because it’s really, really good! ), but I’d be interested to know what the show’s devotees made of it. The moral of the story is laid on pretty thick, with the voiceover telling us “to each his own. Stay in your own backyard and help others to stay in theirs.” Not only does that suggest that the swinging 60s might not have been quite as fearless and forward-looking as we’re sometimes led to believe, it immediately put me in mind of Pleasantville (the show within the movie, at least) and ‘Show Me The Way To Go Home’, the hymn to small-time life used to keep Truman Burbank satisfied in his constructed world. I guess as enough time passes, the parody becomes the parodied. Still, there’s much to enjoy here. Buster (just five years before he died) can clearly still cut the mustard, including in some surprisingly energetic running around and the silent sections are lovely. I just couldn’t shake the sense of a missed opportunity for something bolder. Actual participation in The Third Annual Buster Keaton Blogathon – The General, Factual or Fictional? The General has, as a movie, received a lot of thumbs up. 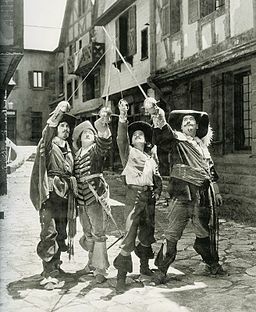 Roger Ebert credited it with “a graceful perfection”, it currently sits at number 34 in Sight and Sound’s (interestingly silents heavy) critics’ poll of the greatest movies of all time and was amongst the first batch of movies inducted into the National Film Registry for preservation by the Library of Congress no less. 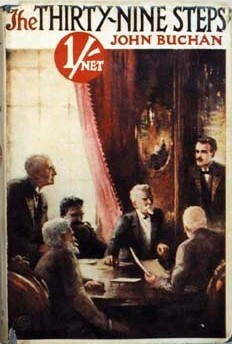 As a piece of cinema, then, its reputation seems (despite the well documented ambivalence of audiences in 1926) assured. But what about as a historical document? I was certainly unaware until I read more about Buster’s career that The General is actually based on a real Civil War incident – namely, the Great Locomotive Chase of 1862. Buster and his collaborator (credited as co-director, somewhat generously by all accounts, including his) Clyde Bruckman based the movie on ‘Daring and Suffering: A History of the Great Railway Adventure’ written by one William A. Pittinger – an active participant in the day’s events (although not, as it turns out, necessarily a wholly reliable narrator). As a Brit whose Civil War knowledge was roughly equivalent to that demanded by Apu’s citizenship test, this came as something of a surprise. But it did light a spark of curiosity, just how accurate is it? All of the named characters (with one obvious exception!) seem to be based pretty much directly on real people. For Johnnie Gray, read a Mr William Allen Fuller, conductor of The General on the day in question. In reality, he was not the only member of the crew to take up the chase (being accompanied by Anthony Murphy (foreman of motive and machine power) and E. Jefferson Cain (the engineer)). Amalgamating these three to one character makes perfect cinematic sense and I get the feeling that Mr Fuller would have wholeheartedly approved, given he seems to have made vigorous efforts to talk up his role at the expense of Murphy and Cain’s. You can see the movie star quality right there. Great hair. On the Union side, ‘Captain Anderson’ stands in for James J. Andrews, leader of the group subsequently dubbed ‘Andrews’ Raiders’ but in fact not a captain or indeed a soldier at all. Andrews was something of an adventurer having been engaged in the (highly profitable) business of running quinine (lots of bugs in Mississippi) from North to South despite (or, depending on your point of view, because of) the Northern blockade. He did use this position to gather information for the Yankees, but it seems unclear whether he felt any great allegiance to one side or the other or whether he was simply engaged in profitably playing one side off against the other. Andrews’ motives for planning the raid are likewise somewhat opaque, with varying accounts of how much he expected to be paid for its successful completion. For all that, though, he conducted himself with considerable daring during the raid and even more dignity in its aftermath. There’s a great movie waiting to be made about him too. ‘General Thatcher’ would be a Brigadier General Ormsby MacKnight Mitchel, popularly known as ‘Old Stars’ and, at the time, riding high on his successful push into Alabama. Thus, far, looking pretty good! Hmm, yes. Perhaps not unexpectedly there’s no record of any romantic complications of any kind. Still, Johnnie doesn’t even know his girl’s on the train until he gets to Union territory (which, as we’ll see, never happened anyway). So, you know, whatevs. Spectacularly back on track here though. In the movie, Johnnie tries to enlist with the Confederate army but is rejected because (unbeknownst to him) it’s decided that keeping the railroad running is more valuable than one more soldier. Allowing for a little compression for dramatic purposes, on this point Buster is wholly accurate. William Fuller did almost joint a militia, but the governor of Georgia proclaimed that experienced railroaders should stay at their posts rather than joining up. A wholly sensible decision given how critical the railroads were to both sides as really the only practical means of moving men, supplies and equipment the vast distances involved in fighting the Civil War. In terms of timing, spot on again! The attack on Fort Sumter, generally seen as the start of the war, occurred on 12 April 1861, whilst the Andrews Raid (pleasingly for fans of symmetry and writers of silent movies intertitles) was a year to the day later. The intertitles for Anderson/Andrews’ tête-à-tête with Thatcher/Old Stars gives a brief, but pretty accurate, summation of the plan, such as it was, with the ultimate aim being the capture of Chattanooga, TN., a critical hub for pretty much all Confederate rail traffic from West to East. Quite who ‘General Parker’ represents is a little less clear. Best guess, a General Don Carlos Buell, Old Stars’ immediate superior who had around 60,000 men in Tennessee at the time. However, expecting him to seize the day on a moment’s notice might have been a trifle optimistic. DC was a cautious fellow, once boasting that he had “studiously avoided any movements which to the enemy would have any appearance of activity or method.” He was hardly alone in this. Indeed, it seems that Abe Lincoln spent a not inconsiderable amount of his time early in the war fielding explanations from various commanders of why they simply could not advance against less numerous Confederate forces. No wonder he looked so grumpy. And yes, they did make their way south to Atlanta by pretending to be Kentuckians looking to join the Confederate Army. This seems to have involved affecting big ol’ Southern accents (I’m thinking O’ Brother Where Art Thou?, but then I think everyone in Minnesota sounds like Marge Gunderson so I’m probably not the best judge) and, after one close shave, swapping some blue Union army trousers for a less conspicuous yellow striped number. If anything, this charade seem to have been too convincing, given that two of the party actually ended up joining a Confederate artillery unit. The actual theft of The General is almost eerily spot on, historical accuracywise. Yes, Andrews and Co did just drive away, unchallenged until Fuller (and Murphy and Cain) went running after them. Yes, the pursuers did set off thinking it was cowardly deserters, not beastly Northern raiders who had nicked their train. The movie does swap breakfast for dinner, in fact the journey was so early that two of the raiders overslept and missed their 5am (!!) departure from Marietta. For perhaps understandable reasons, the reported jeers and laughter of the crowd, along with helpful suggestions along the lines of ‘get a horse’ are not included. We may be divided by geography and time, but unhelpful wiseacres are universal. The chase itself is also surprisingly true to history, at least up to a point. The pursuers really did progress through a variety of means of transport, including a hand car (although rather than the ‘see saw’ type thing we see in the film, it was apparently a weird sort of gondola arrangement propelled by pushing poles along the ground), which really did hit a break in the rails and tumble into a ditch. The raiders really did throw all manner of stuff, including sleepers, on the track in a bid to slow them down. No one seems to have sat on the cowcatcher and bounced them out of the way, although Fuller did, somewhat unconvincingly, claim to have pulled one (weighing in at about 900 pounds) out of the way on his own. Fuller and co really did give chase on the Texas (in reality, following stints on the Yonah and the William R Smith). Moving on, the raiders really did pass up opportunities to engage their pursuers in the mistaken belief that they were more numerous and better armed than was in fact the case and the chase did in the end become a question of who ran out of wood and water (both of which a 19th century locomotive consumed in heroic quantities) first. After reaching the almost unbelievable speed of 60mph [insert wry observation about the probability of a modern British train achieving such a feat], the General finally ran out of both (in fact, you might say it ran out of steam!!) about 15 miles from Chattanooga. At which point, Andrews and the rest of the raiders headed for the hills. There was, sadly, no train based cannon, so a bit of artistic licence there. In other ways though, Buster seems to have stayed more accurate than his source material by leaving out some of the more, shall we say, florid elements of Pittinger’s account – primarily, the notion that at one point a train literally jumped over a gap in the track. I’m as big a fan of Speed (the movie, not the controlled substance) as the next man, but that I am not buying. So, up to a point, impressively accurate. However, sadly for history (but gloriously for cinema) after a point Buster diverges from the facts completely. Fuller never left Confederate territory and there was no chase back towards Atlanta, which means no trains crashing through burning bridges (in reality, the Texas remained in service until the early 20th century and The General has pride of place to this day in the Southern Museum of Civil War and Locomotive History). In reality, after fleeing the scene the raiders were captured, imprisoned and in eight cases (including Andrews himself) hanged as spies. Eight more escaped and the remaining six were later exchanged for Confederate prisoners. 18 of the Andrews Raiders (including the two sleepyheads, but not Andrews himself as a civilian) subsequently received the Congressional Medal of Honor – amongst their number the very first recipients of the United States’ highest military honour. These basic facts, though, skim over a number of prison breaks, flights through hostile territory (possibly the inspiration for Buster’s rainy night with a bear) and no small amount of controversy. You could make a dozen movies about this stuff. Up to a point, The General stays close to history, often strikingly so and whilst the second half of the movie is fiction (as Keaton later said “the original locomotive chase ended when I found myself in Northern territory and had to desert. From then on it was my invention, in order to get a complete plot.”), this comedy still scores way, way higher than many ‘serious’ historical films (I’m looking at you Braveheart and Anonymous). Indeed they will, Mel, on account of all the lying. If anything this little exercise has made me admire the film and its maker even more. You could make a number of movies from the source material, from a number of perspectives – Buster took far from the most obvious and made, if not the best possible movie, something pretty damn close. Bravo, sir, bravo. This is, inevitably, a very quick canter through a long and fascinating story. If you want to fill in some gaps, I can heartily recommend ‘Stealing the General: The Great Locomotive Chase and the First Medal of Honor’ by Russell S. Bonds (available from Westholme Publishing). If, on the other hand, you fancy reading something along these lines but written by an actual historian who actually knows what they’re talking about, might I point you in the direction of Reel History (Atlantic Books) by the brilliant Alex von Tunzelmann? 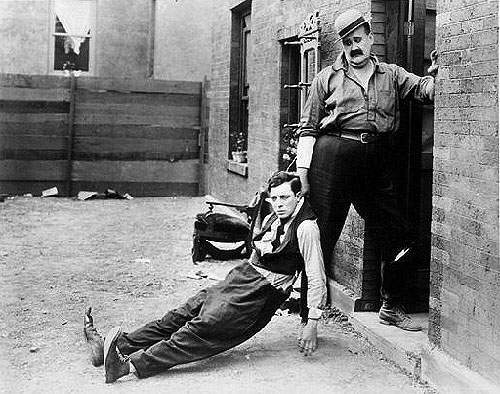 Actual participation in The Second Annual Buster Keaton Blogathon – Big Joe Roberts. An Appreciation. A fine man once described me as ‘a big man, but small’. He was being stupidly generous, but the phrase stuck with me and I think it’s as good a description of Buster Keaton as any. A (figurative) giant of cinema at 5’6” (the same as Charlie Chaplin, two inches shorter than Humphrey Bogart who I’m slightly disappointed to find was pretty much regulation height for his time and only had to wear boxes on his feet in Casablanca because Ingrid Bergman was a great big tall person), he used his relative lilliputianality to great effect in, for example, The General. Apart from the gag early on when he measures himself against someone who has (unlike him) been accepted into the Army, he spends the whole movie surrounded by taller people. Speaking as someone who definitely does not have any angry short man issues (and don’t you forget it, ok? 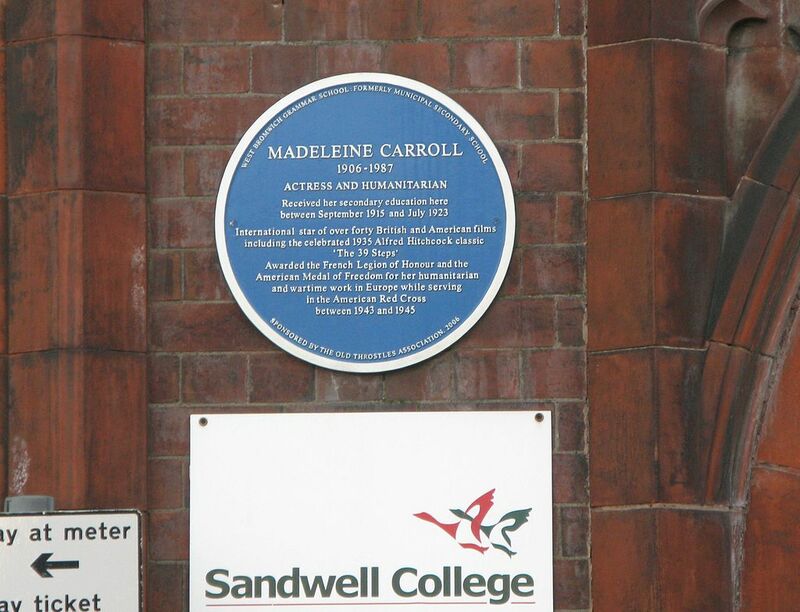 ), I’ve always found this an effective and endearing element of his work. The character doggedly persisting whatever obstacles the world placed in his path, always punching up if you will, just wouldn’t have worked as well for a lankier specimen. That said, there are times when even the biggest small man needs a big man on his side (it’s a really high shelf, alright, what idiot put the teabags up there anyway?). For Buster, that big man was Joe Roberts. Standing at an almost ridiculous 6’3”, Big Joe was (like so many of the silent stars) a veteran of Vaudeville and indeed was a neighbour of the Keatons in the Bluffton Actors’ Colony. He made it to Hollywood just in time for One Week (good timing, Joe!) in which he played a piano mover – thereafter he appeared in nearly all Buster’s shorts; notably as the dad in Neighbors, the cop in Cops and the cop/dad in The Goat. When Buster made the move to features, he took Big Joe with him to appear in both Three Ages and Our Hospitality – doubtless he would have continue to do so (there are at least three parts in Sherlock Jr. that would have fitted him like a glove), but he suffered a stroke while making Our Hospitality and, although he returned to finish the movie, died shortly thereafter. And that, on the face of it, is about that. Add in half a dozen non-Buster shorts and you have a career that, while far from unimpressive, doesn’t on the face of it distinguish our man from many others playing ‘the heavy’ at that time. 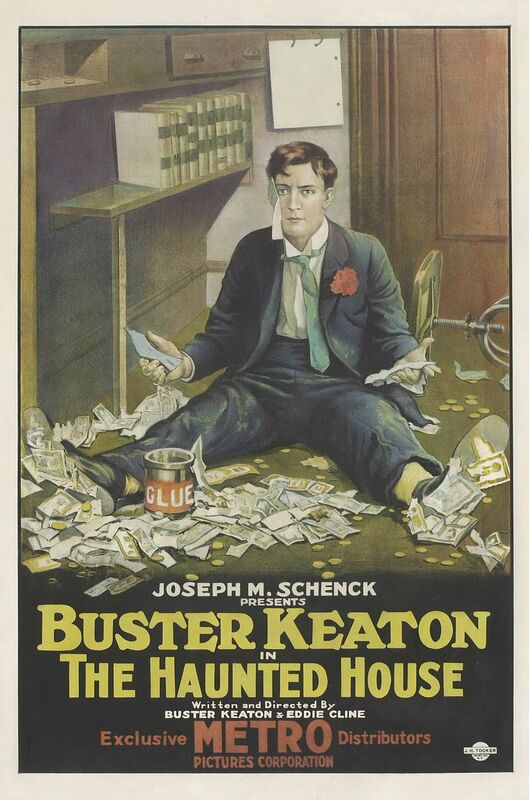 And yet not only did Buster stick with him throughout his career in shorts (compared to, for example, his leading ladies who changed frequently), Big Joe gets more attention in most Keaton biographies than any co-star other than Arbuckle. How come? diving through the transom window (the little rectangular window between the top of the door and the ceiling, non-architecture geeks). Buster’s gymnastics are, of course, breathtaking but they’re also impossible unless Big Joe gets himself into exactly the right position and, perhaps more importantly, unless Buster absolutely trusts him to do so. Take away the rigorous discipline you needed to survive in Vaudeville from either party and I’m not sure the stunt is even doable. This very picture hangs on the wall above my TV. that oversight as a matter of urgency. Secondly, and more speculatively, I think it’s because you never get a sense that there’s any malice in him. Yes, he’s the antagonist but to me he has no more ill intent than, say, the truculent horse in Cops or the staircase in The Haunted House. He’s just one more obstacle that the universe has placed in front of our hero. There’s often a level of discomfort about watching a big guy beat up on a little guy, even if it’s for comic effect. Big Joe never comes across as a bully. The universe, however, also put an obstacle in Big Joe’s way in the form of Buster’s dog Captain, a Belgian Police Dog. Ferociously protective of his master, he was given to attacking anyone who messed with Buster – which frequently meant Joe. In fact, he apparently once went so far as to attack a screen showing a scene of Buster in peril. Silent movies were clearly plenty realistic enough for Captain. So, for once I’ll raise a glass to the big man. Thanks Big Joe. You were a big man, but big. I’m lucky enough to have some lovely friends. Witty, erudite, appreciative of a good scotch egg. However, until recently they had a collective blind spot – old movies. And by old, I mean up to and including Ghostbusters. Certainly, black and white was, for them, an undiscovered country that puzzled the will. This sort of nonsense was generally greeted with some level of bemusement. Of course, I concealed my annoyance with masterly self-control but still, something had to be done. So, when Casablanca popped up at the BFI (great cinema by the way, if you’re in London you should definitely find time for a visit) I seized my chance and, with a surprisingly small amount of mither, persuaded a small but select group that a black and white movie could and would be a rewarding and entertaining experience (or at least that it’s only 100 minutes long and the seats will be comfy). 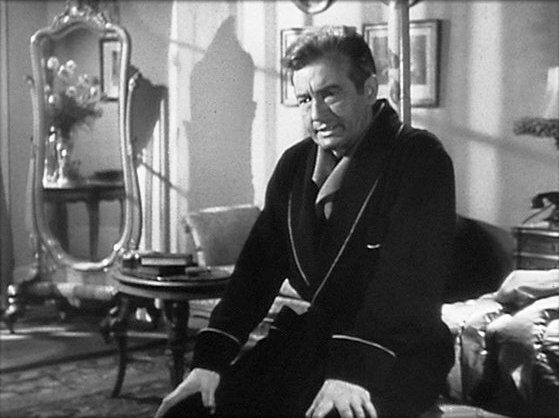 Claude Rains is hilarious. For most actors, “we haven’t decided yet if he committed suicide or died trying to escape” is an ok line, maybe not to be played for laughs at all, he makes it brilliantly funny. Humphrey Bogart shows why he’s a movie icon. He really grounds the thing, keeping us invested in the story while the supporting cast devour the scenery (I’m looking at you, Peter Lorre, because you’re brilliant). It teeters on the very brink of the ridiculous but, I think due to the great cast, never quite topples over. Chucking the Vichy water in the bin and “Play it! Play La Marseillaise!” could have been cringy, but in these hands they’re joyous. Not to worry, Claude, you were excellent! It had genuinely never occurred to me that anyone didn’t know that, but if you’ve never seen it or read about it then why would you? Psycho – although, interestingly, a couple of flat out refusals to try that one. That’s a movie with a reputation. *The same bloke was lukewarm about both of these. The plot expectations continue to be fascinating (and to make me feel slightly like a Victorian explorer who finds a tribe as yet untouched by civilisation – although without the urge to shoot them and nick their country), one that sticks in the mind is that the cop who pulls Marion over early in Psycho would come back and either rescue or arrest her. Again, totally reasonable if ‘shower scene’ means nothing to you. In a sense, of course, I’m watching a different movie to them. Either I’ve seen it before or I’ve got a reasonable expectation of what the plot consists of, they’re starting with a blank slate. 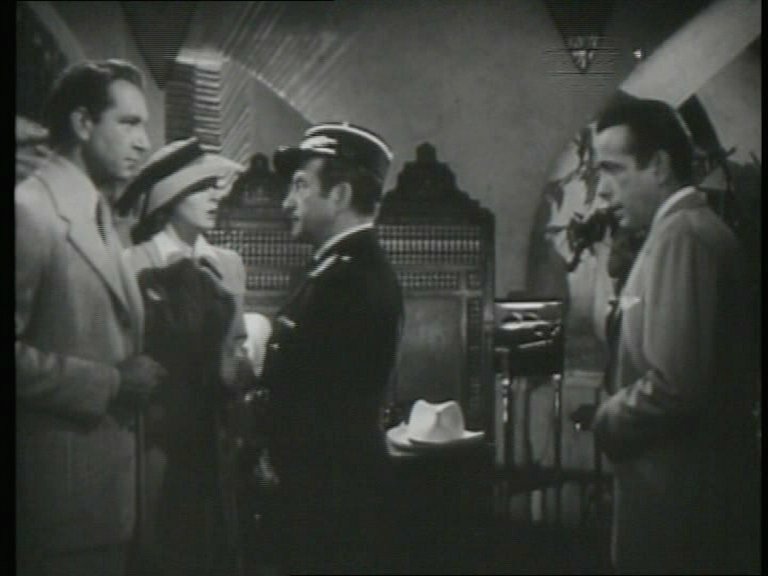 I recently saw Casablanca again with another first timer, it still worked its magic but for me it was a slightly different experience. The politics of the movie (“isolationism is no longer a practical policy” etc) have always felt very much of their time, but right now the references to a tortuous refugee trail seem much more urgent and, of course, the Marseillaise scene had a moment following the terrible events in Paris. I guess movies stay the same, but the eyes we see them through do not. Coming between 5-7 December, a punchy yet informative look at using Casablanca to introduce the uneducated to classic film. What are the 39 Steps? Come on, answer me! What are the 39 Steps? Ok, ok, cool your boots man. All will be answered in my upcoming contribution to the Swashathon hosted by Movies Silently on 7-9 November. Posted as part of the Shorts! Blogathon hosted by Movies Silently. My introduction to Buster Keaton came about a year ago at a showing of The General at the BFI and, to tell you the truth, I was a little nervous. 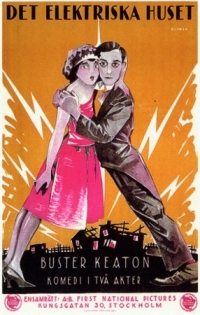 I’d never been to a silent film before – aren’t they supposed to be hard work? Only to be watched for serious, academic purposes? My concern grew when it turned out that there was a short film preceding the feature. So, I have to watch 20 minutes of people running about incredibly quickly then getting kicked up the arse before I even get to the movie I paid to see?? Now, obviously I wouldn’t be sat here now, making a small contribution to this excellent blogathon if those concerns had not proven to be ludicrously misplaced. The short in question was One Week, which turned out to be a 20 minute slot of pure joy and set me up perfectly for the genius of The General. In the following months, I caught up on Buster’s other short films and some patterns started to emerge, the most striking for me being the recurring use of mechanised, or automated houses. One Week does it a bit (although more in the construction than in the finished article – the intended finished article at least! ), but the idea’s explored more thoroughly in several of his other works. In fact, you can see the level of ambition and sophistication develop from the charmingly homespun ropes and pulleys arrangement of The Scarecrow, through the much slicker stairs/slide in The Haunted House to the automated-beyond-what-we-have-today dwelling in The Electric House. As with a lot of Buster, you could intellectualise this stuff. How radical to use the mise en scène as a character in its own right! Is this absurdity a nod to Dadaism? You could do that, or you could think “Wow! This is just like Wallace and Gromit!” If you haven’t seen Wallace and Gromit, particularly The Wrong Trousers (and if you haven’t, you need to address that oversight as a matter of urgency because it’s one of the crowning achievements of modern civilisation) it’s an everyday tale of a Plasticine man, his Plasticine dog and how they foil a Plasticine penguin’s plot to steal a diamond (not, I think, Plasticine). Its joys are many, but significantly include the duo’s house which is chock full of ingenious labour saving devices, from a miniature train used to deliver supplies of cheese (Wallace does like a bit of gorgonzola) to a bed rigged up to tip Wallace straight out into his chair where he’s (automatically) dressed and (automatically) provided with tea and toast. Now, I don’t know how familiar (if at all) the makers of The Wrong Trousers were with Buster’s shorts (although the studio has discussed Shaun the Sheep’s Buster-like blank face, a quality he shares with Gromit), but it doesn’t really matter anyhow. I just find it fascinating that two pieces of work separated by time, culture and form can share DNA. Teen comedies can borrow plots from Shakespeare and Jane Austen, a romantic comedy can be based on a French tragedy about a man with a massive nose and a man from the 1920s can share some tricks with a piece of clay moulded 30 years after he died. people using his outside toilet without asking. Many would have suggested pragmatic, even tedious solutions (maybe move your alarm clock further from the bed and put a lock on the khazi?) but not our man. Instead, he rigged up Ed’s bed so that an ignored alarm would be swiftly followed by the covers being automatically ripped off and then by the bed itself being hoisted up by an electric motor to tip him onto the floor.Even more brilliantly, the outhouse was rigged up by means of hinges and a fake clothesline such that a tug on a rope would lift the walls of the shed (which, by the way, was on a hill overlooking the town), thus leaving the interloper still on the throne but now somewhat more conspicuous than they’d envisaged. Sadly, history does not seem to record how many ran for cover (ideally, tripping over their trousers as they did so) and how many had the nerve to simply wave at any onlookers then go back to reading the paper. Coming at some point on 2-4 May, some trenchant views on mechanised houses in Buster Keaton’s short films.